MOCAP Wide Flange Tapered Plastic Plug Caps are inexpensive dual function closures which can be used as either a plug or a cap. These tapered polyethylene plug caps are made from tough, but flexible polyethylene to form a secure fit, yet are easily removed. These Plastic Plugs feature a wider flange than our standard T Series plug caps, adding protection for external surfaces and preventing the plug from accidentally being pushed all the way into or through an opening. MOCAP stocks Wide Flange Tapered Plastic Plug Caps in many sizes for immediate shipment. 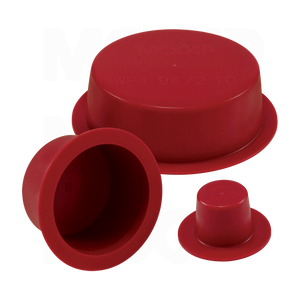 MOCAP WF Series Plastic Plug Caps have a tapered design which allow it to be used as a cap for multiple threaded and non-threaded applications. Use MOCAP Tapered Plug Caps to plug a wide range of openings, including threaded and non-threaded holes, pipe and tube end plugs, connector ports and fittings. Review MOCAP's complete Line of Masking Products.